Last night I was nestled between a couple of casuarina trees, I was partially sheltered from the fearsome wind that picked up strength as it rolled in across the plains from the north during the night. There were times when I felt my little MSR Hubba tent would blow away, but we both survived the night intact. 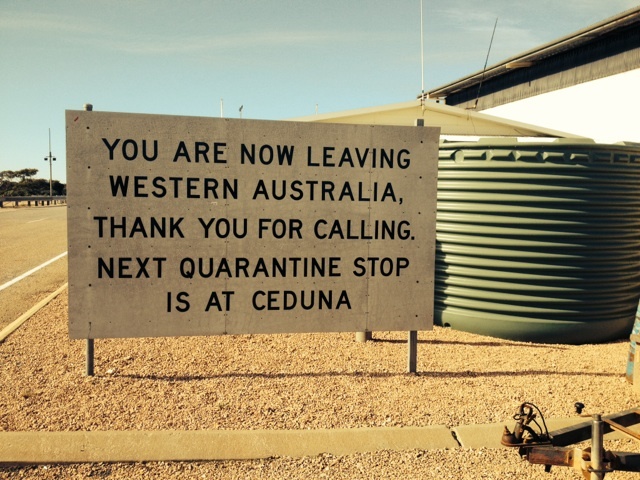 After three eventful weeks, today I left Western Australia. 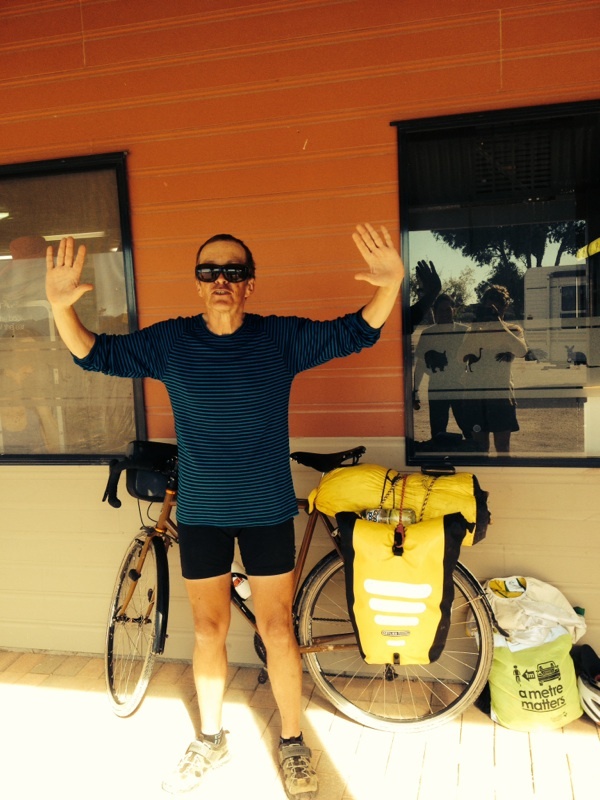 It was a short 68 kms of open country until Eucla, then another 12 kms to Border Village South Australia. I have covered some varied country in WA, from Perth, down through the South West, farms and forests to the sea of Albany and Esperance then outback to Norseman through the WA section of the Nullarbor. With a fair wind In warming conditions, I scooted across the plain. 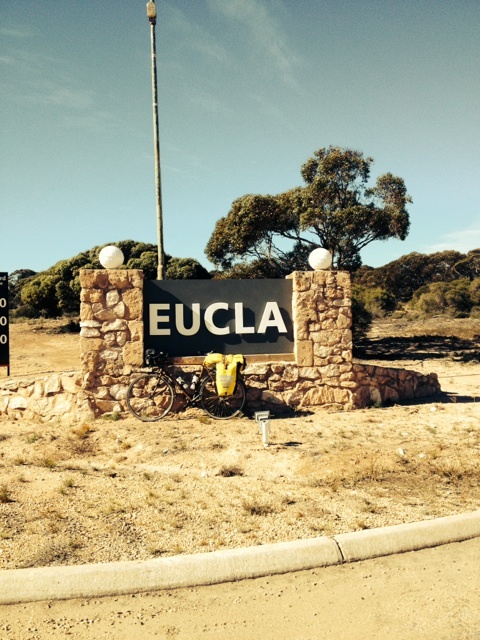 There was an almost imperceptible climb early, then over the last 20 kms I was noticeably riding downhill until I reached the outskirts of Ecula, then a steep 2 kms climb up Eucla Pass where I was rewarded with my first sighting of the Great Australian Bight. 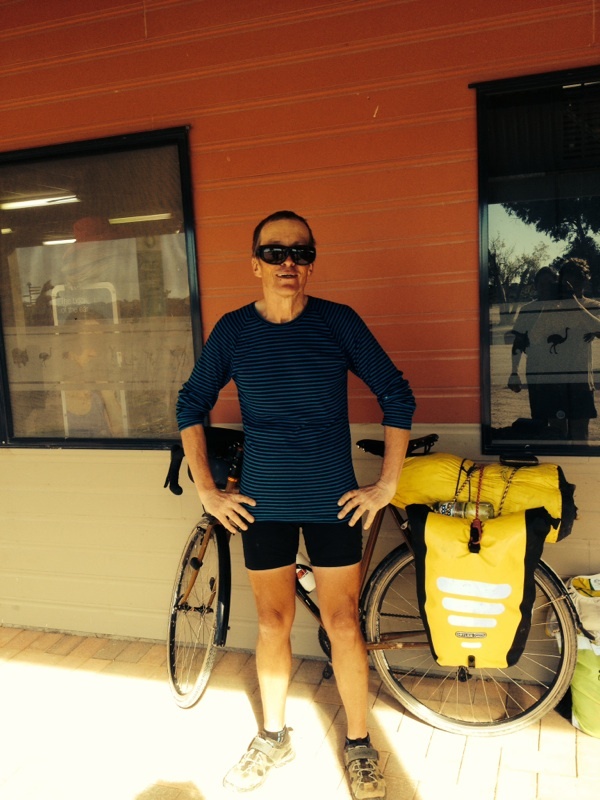 A brief stop, I pushed on, past the quarantine station to tonight’s camp at Border Village, which isn’t a village at all just another roadhouse, where an obliging trucker took my photo. I’m taking on extra food and water, as I will out of range for the next couple of days wild camping along the Bunda Cliffs. No I haven’t lost my mind but I do have directions to some buried treasure. On tomorrow’s ride, I should pass a point on the highway where I turn off to a track that leads south towards the ocean. I’ll follow that track for 2 kms and come to a T junction. 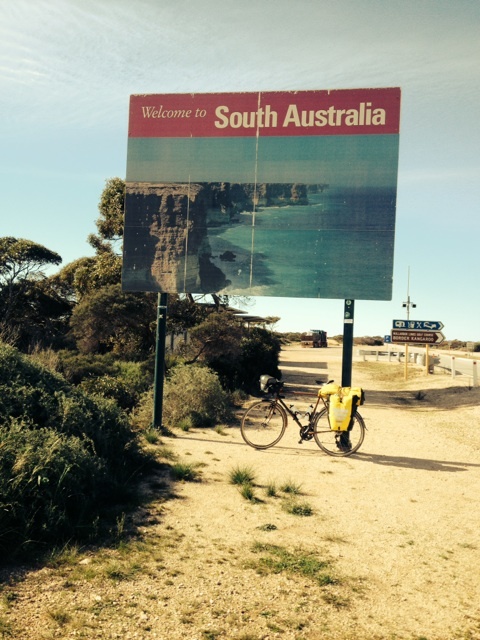 Turning left for a further 3 kms near the edge of the cliffs, I should find 4 old fence posts and buried on the north side of the northernmost post is a log book for Nullarbor cyclists. This location is apparently an idea spot to whale watch as well. My plan is to dig up the log, read the contents by my campfire while watching the whales- Lets see how it transpires. Tell me more about this hidden logbook Nick. Sounds like it would be worth investigating sometime in September.